When the base received a report at 0720 on 31/07/43, Brazilian Air Force Command was immediately notified and advised to dispatch the PBY and a Hudson to the scene. At the same time two additional Mariners plus the BARNEGAT were ordered to proceed. Mariner four, the first U.S. plane to get off, was distracted and diverted from the actual scene of attack first, by the incorrect position given by 74-P-7, and second by the appearance of a Brazilian Hudson, who was engaged in depth bombing a school of whales. By this time the second Brazilian Hudson arrived over the real scene of action and hurriedly dropped short. At 0900, 1 hour and 42 minutes after the PBM attack, the Brazilian PBY arrived and delivered two attacks on the crippled U/B while Mariner seven drew the U/B's fire. The first PBY drop was observed to be slightly short off the port quarter but the second exploded directly over the submerged stern of the U/B. The U/B sank in 3 seconds. Unfortunately all film in Mariner seven's camera had been used up on his own attack and no photographs were obtained of the Brazilian attack. Mariner four, who was then still looking for the interesting area, was ordered to take up Mariner seven's barrier sweep. Mariner two, the second PBM, was ordered to relieve number seven who had received three hits in the engine nacelle. Mariner two performed an excellent job of directing the BARNEGAT to the area and aided materially in the rescue of the 12 survivors. It is difficult to explain how or why the two Brazilian aircraft arrived so promptly over the U/B position when the original position reported was in error by 35 miles. Attention is invited to the fact that the U/B forced beam attack on 74-P-7; that he pressed home his attack deliberately and vigorously in the face of heavy A/A fire; that his second attack was nearly bow on - both attacks being the most difficult to deliver and that in spite of the above he so crippled the U/B that it was not able to submerge and that it had to stay surfaced and fight it out until the final blow was dealt by the PBY. At this point the writer points with pride to the fact that the pilot of the PBY was recently checked out and trained in the art of ASW by VP-74 at Aratu Sea Base. The results are extremely gratifying, and full credit for the final kill is credited to the pilot and crew of this plane. The pilot of 74-P-7 was not justified in changing the Squadron doctrine in regards of the D/C spacing from 72 to 65 feet. Better photographs of this action might have been obtained had this squadron received the 16 mm. gun camera film requested last May. The usual good performance of the BARNEGAT in recovering the survivors is again noteworthy. The complete operation from attack to recovery of survivors took only four hours and 45 minutes. The U/B Commander stated that he lost most of his men by gun fire from the Mariner. The removal of the bow turret from this type aircraft will be sorely missed. The Brazilian air force is deserving of special credit for the success of this action, especially because of their inexperience and the inferiority of their equipment. One night about a week before U-199 was sunk, she was patrolling surfaced in approximately 24º 00" S., 44º 00" W. at about 2100 local time when the sound of an aircraft was heard on the port quarter. Kraus immediately went to the bridge and ordered an increase to full speed with an emergency turn. He also ordered the guns to be manned.The aircraft then fired a number of flares. Before U-199 could bring any of her guns to bear, however, she observed the aircraft to crash into the sea a short distance from her, a loud explosion being heard simultaneously. Following the attack of about 26 July, U-199 continued to patrol off shore, but sighted no suitable targets until the evening of 30 July, when she sighted an independent from periscope depth. The vessel had very short masts and was on course 1300. U-199 did not surface until dark, by which time the target had escaped in the dusk. U-199’s Quartermaster said that he was able to navigate quite satisfactorily by taking sights during the whole period in her operational area. He never once relied on local radio bearings. 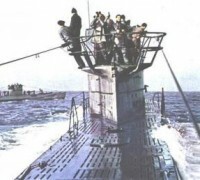 U-199 was proceeding surfaced on approximate course 300º on the morning of 31 July 1943. It was Kraus’s intention to make the 100 fathom line and then submerge and lie in wait.An aircraft was sighted some miles away. Prisoners were sure that U-199 had not received a G.S.R. contact. As far as they were aware, the G.S.R. set was not manned at the time.Immediately the sighting was reported, the Quartermaster, who was on watch at the time, gave the order to put the helm hard over to starboard and increase to full speed. This procedure was endorsed by Kraus himself, when he came to the deck a few minutes later. As soon as the aircraft was within range, U-199 opened fire with all her armament. A number of anti-aircraft rounds were fired by the 105-mm. gun.The aircraft returned the fire, scoring several hits on U-199’s Coning Tower, and straddled her with a stick of bombs or depth-charges, which caused slight damage below decks and an escape of oil from her fuel Tanks. There was one casualty, a man from the upper-deck gun crews. (O.N.I. Note: The U-boat opened fire at a range of five miles. The aircraft dropped six bombs in a beam attack. These all detonated very close to the target, which subsequently appeared unable to submerge and commenced a series of erratic maneuvers, meanwhile emitting a large quantity of oil. The aircraft immediately pressed home a second attack up stern with its remaining two D/C’s, at an altitude of 50 feet. These detonated close to the U-boat’s starboard quarter. The U-boat’s gun crews opened fire on the aircraft’s approach, but were driven below by the aircraft’s turret guns. Despite the punishment she had taken, the U-boat managed to stay surfaced. She was smoking heavily abaft the conning-tower.) As soon as these attacks were over, it was found that U-199 could no longer proceed submerged. She was, moreover, incapable of proceeding at more than very slow speed surfaced. Kraus thereupon determined to close the shore until the water was shallow enough to permit him to lie on the bottom and effect repairs. He felt convinced that, if he remained surfaced, he would be subjected to further aircraft attacks. He accordingly instructed his quartermaster to take soundings constantly until the depth of the water below the boat’s keel was no more than 135 meters (about 70 fathoms). U-199 accordingly altered course and proceeded slowly inshore. The radioman signaled that she had been attacked and gave her position as 24º 00"S., 43º 00" W.
As soon as the bombs began to fall, Kraus realized that the position was hopeless and ordered his men to abandon ship. Most of the seamen personnel was already on deck. The remainder of the ship’s company made a desperate effort to climb up the Conning Tower hatch. Only one, the quartermaster, escaped. He stated that when he arrived on deck, the water was already as high as the 20-mm. gun. Survivors stated that little or no chlorine gas had been generated. They believed that the damage had been mostly caused aft.(O.N.I. Note: Survivors were picked up at 1200P by U.S.S. Barnegat. PBM 7 remained in the area during the Brazilian aircraft’s engagements, drawing the U-boat’s A/A fire. It was hit in one engine, but returned to base successfully.) The last signal made by U-199 was that she was sinking in approximate position 23º 50’ S, 40º 30" W.
U 199 sank only two ships during her mission in south Atlantic. They were: US merchant Charles Wilson Peale and the British Henzada. A Brazilian fishing trawler, Shangri-La was added to the list once Brazilian maritime Court recognized in year 2000 evidences that the barge was sunk by gunfire based on documents of U 199 survivors interrogations. Brazilian A-28 Hudson seen above. They were employed in convoy protection and patrol duties. PBM Mariner. The sturdy versatile patrol bomber had an important role for hunting the U-Boats. The aircraft above, Nickel Boat sank U-513 off Santa Catarina state during a routine patrol mission. Brazilian Air Force PBY-5 Catalina. 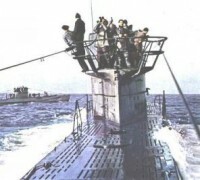 It was the first brazilian aircraft which sank a German U-boat U-199. AVP-10 Barnegat. The US Seaplane tender which rescued U-199 survivors.